Runwood Homes residents up and down the country are putting on their gardening gloves and sowing their seeds as they take part in our Breath of Fresh Air competition. Set up by the Dementia Services Team, all our residential care and nursing homes have received six packets of secret seeds to get going and start sowing. The first resident to correctly guess all six of the various fruit and vegetables they are growing will win the Breath of Fresh Air Competition and receive £100 to spend on making their garden even more beautiful at the residential care home in which they reside. Alternatively, the winnings can be used for activities, outings or for extra equipment for residents to enjoy. The annual gardening competition gives residents a real zest of life as they enjoy being involved in a fun, green-fingered activity. Residents relish in the gardening goodness by entering the competition and watching the fruits of their labour flourish, and being involved is easy; Runwood Homes provides raised flower beds situated right on the doorsteps of their residential care homes, making gardening accessible for all. Planting is also done around the table together as an engaging group activity. Resulting in a real sense of achievement, residents must prepare the soil, plant their secret seeds and nurture them, whilst guessing along the way what it is they are growing. Gardening is often a favourite past time and hobby of many, and with skill and experience of gardening increasing with age, our residents make for the perfect guessing group. Rather than being a test of knowledge, the competition aims to spark conversation and welcome discussion and is dementia-friendly too; residents will recall varieties of plants, flowers, fruit and vegetables either in the present moment or in the distant past. 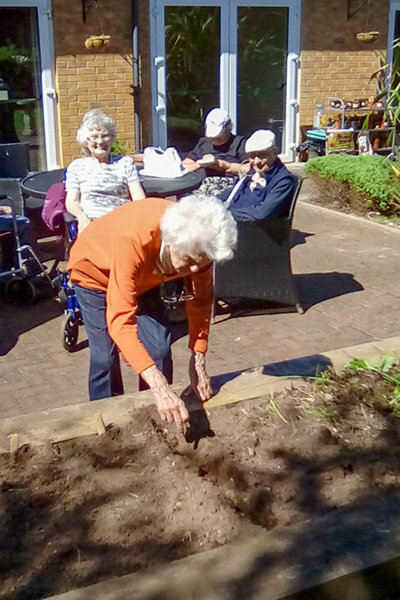 By encouraging talks about gardening experiences as well as seasonable fruit, veg and flowers spotted in the gardens or on outings, residents will feel a sense of wellbeing whilst reminiscing and communicating with their peers and carers. Breath of Fresh Air creates interest and encourages involvement in the garden and spending time outdoors has a variety of fantastic health benefits including increased Vitamin D levels, promoting exercise, lifting your spirits, faster healing times and improving concentration levels. We would like to thank Thompson & Morgan, one of the UK's largest mail order seed and plant companies, for donating seeds for this Competition. Our Dementia Care Services and our ‘dignity for everyone’ campaign ensures that activities are organised with residents interests and abilities at front of mind, with choices, self-worth and a sense of purpose all of great importance to us. Contact us to find out more or find a Runwood Homes Senior Living residential care home near you. Runwood Homes Senior Living provides expert care for older people, including those living with dementia.